The Indian language is hugely complicated and diverse and has been shaped, like most things in India, by years of cultural variety, regional differences, race, money, religion and war. The origins of the languages of India bring with them great stories and history which blends in with the wonder and mystery that so makes India so hard to define. t has proved itself as a country that can perfectly host and assimilate a huge amount of different lifestyles and manners. Although not always by its own accord, throughout her rich history, India admitted adventurers, attackers, conquerors and merchants whom all shaped India into what she is today and in return, became shaped themselves by the country that soon became their home. Hindi is not the easiest Indian language to learn but it is definetely the best as it is probably the most commonly spoken language in India. I tried to learn when I first arrived in India but soon found that it was pretty pointless as everybody wanted to speak English to me. It was, however, useful to pick up some general phrases, my favorite of which being Tum ho Ati Sunda, which roughly translates as You are a most beautiful young lady! Other phrases such as Challo meaning Let's go always evoke a smile from your rikshaw driver and others like Namaste (Hello) are pretty standard. If you are keen about learning Hindi or at least some useful phrases then I have written a few pages about it. Be warned, however, that you won't have much of a chance to practice it! All the basic words such as things like: Thank you, Hello, Goodbye, etc. How do I find the pub? Where is the railway station? Please clean my room? Now, you can finally count to 1000,000,000 in Hindi! India is a country of different and contrasting cultures and its linguistic chart is just as diverse. There is no such thing as the ‘Indian language’ as there are 17 (recognised) major regional languages in India, however, the different dialects in India number several hundred and the number of actual spoken languages reach over 2500. Similarities in people’s mother tongues are easy to find making language classification a difficult issue since it is hard to prove which are just dialects of the same language or which make separate languages up. According to the Constitution of India, there are 22 recognised national languages at the moment. The Eighth Schedule, which contains the official list of the Indian languages, originally included 14 acknowledged languages but since the 71st and the 92nd Amendments, a further 8 were added to this list. The 22 recognized languages are as follows: Assamesse, Bengali, Bodo, Dogri, Gujarati, Hindi, Kannada, Kashmiri, Konkani, Maithili, Malayalam, Manipuri (sometimes called Meitei), Marathi, Nepali, Oriya, Punjabi, Sanskrit, Santali, Sindhi, Tamil, Telugu and Urdu. The official languages of the Union of India are Hindi and English. Most of the Indian Languages have their own native alphabets; the exceptions are Kashmiri, Punjabi, Sindhi and Urdu which use modified versions of the Arabic script. Hindi, the Indo-Aryan and also several other Indian languages are using the Devanagari script which is written from left to right and is also the writing system of Nepalese. Interestingly, the Hindi and Urdu language come from the same source, their speakers can perfectly understand each other, but they have completely different scripts. Urdu uses the Persian-Arabic script while Hindi is written with Devanagari letters. Hindi belongs to the Indo-Aryan language family and is a direct descendant of Sanskrit which is recognised as a so-called classical language of India. Hindi is the most commonly spoken language in India and is also the official language of most states including Bihar, Chhattisgarh, Haryana, Himachal Pradesh, Jharkhand, Madhya Pradesh, Rajasthan, Uttarakhand, Uttar Pradesh and the National Capital, Delhi. 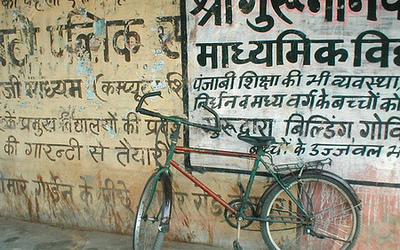 It is spoken by more than 150 million people in India (about 20% of the population regard Hindi as their mother tongue). The accents and dialects are different from region to region, state to state but Hindi is the most popular second language after English, although in the Southern parts of India not many people speak Hindi as they prefer their local languages or English. On the other hand, Hindi also functions as a mother tongue outside the territories of India e.g. in Fiji, Mauritius, Nepal and Pakistan. The Hindi language is written in Devanagari script. English has a special role in India as it is the co-official language of the Constitution. One can say that in India everybody speaks English – well or badly but they speak... The use of English in India began in the colonial times when it was the language of the political power, the language of the Raj; and today, English still carries great prestige and symbolizes advancement in the eye of the Indians. Moreover, it is not far from the truth that English is actually the official language of India in the practical sense. It is the language of the government, the media, the education and the elite, and it also appears useful by reason of job opportunities and as a medium language in a country where people speak thousands of different languages. Traffic signs in India are usually bilingual; they give information in both English and the local language, so do the numbers. It should be noted that Indian English for linguistic and cultural reasons, differs greatly from SSBE (Spoken Standard British English) to such extent that it has been dubbed Hinglish. Language of administration: English & Hindi – Administrative documents and communication within the central government may be in either Hindi or English. Language of legislation: English & Hindi – Parliamentary businesses may be in either Hindi or English but authoritative texts of all laws are required to be in English! Nevertheless, there are people in India who do not speak any other languages than their mother tongue, thus the Constitution gives them the right to be able to express themselves in their own languages to any agencies. Language of judiciary: English – Proceedings of the Supreme Court are required to be in English. The majority of the components that make up the Indian language belong to the Indo-Aryan or the Dravidian language families. The former is a subdivision of the Indo-European language family and is spoken by 70% of the Indians mostly in North India while the Dravidian languages are only spoken by 22% of the population and are predominant in the South. Other Indian languages are from the Austro-Asiatic or the Sino-Tibetan (within that, the Tibeto-Burman) linguistic families and there are a few language isolates as well (e.g. the Nihali –or Kalto- language, native to Maharashtra state).